Who can resist that adorable face, fluffy ball of fur and loyal personality which is a Shih Tzu? And, the fact that Shih Tzus do not shed, because of their long coats keep growing is a plus as far as keeping your home free of dog hair. Unfortunately, the famous long coat of a Shih Tzu, also makes grooming it a skilled job and not a task that the average person can perform. Most of the long-haired dog owners I know pay at least £35.00 once every few months for routine professional Shih Tzu grooming. The Shih Tzu is considered to be an exceptionally attractive looking dog, and few would contest that. Their long, flowing coat has two layers which for the sake of convenience we will call an under-coat and an outer-coat. Daily brushing and grooming is needed to keep these little dogs looking amazing. A few Shih Tzu owners do keep their dogs trimmed down in a short haircut to make it easier to care for their coats, but most owners adore the charm of their dog’s long coat and like to show it off. Also, if you intend to show your dog at a dog show, you will need to keep the coat long. So how can the Shih Tzu owner living to a budget, avoid spending on a trip to the dog groomers’ every time their pet’s hair gets long? We will assume that like me, doing the grooming yourself at home isn’t feasible, after all it takes a period of training and no mean amount of talent, to neatly cut a dog’s hair. I now own my third Shih Tzu, but I still get my Shih Tzu grooming to the groomer. The first Shih Tzu grooming tip is that you only need take your pet once every four or five months, as long as you groom daily and bath your dog regularly. By reading Shih Tzu books and getting tips from professional groomers on how to maintain doggie hygiene you can find tips about this. The books explain that a young Shih Tzu puppy really doesn’t need a lot of grooming to keep it’s hair free of tangles, until it gets about 5 months or so old. From then on it depends, for all dogs, on the type of hair they have. Dogs with a thick cottony coat will require more grooming and at an earlier age than one with a thinner silkier coat. But, don’t think that you don’t have to worry about grooming until the coat starts tangling? No, take care here!. So our second Shih Tzu grooming tip is that a puppy needs to be gently introduced to being groomed gradually, so although the coat of your young dog might not be matting right now, you need to start by teaching your puppy to be used to being groomed. If you decide to keep the Shih Tzu’s hair shorter when young then beware of the fact that, when he grows older he may be willing to accept lot of regular brushing willingly. So, that confirms our second Shih Tzu grooming tip that early training by introducing your dog to grooming, will make him much easier to handle later when he is older, and is trimmed. Also, bear in mind that trimming may be needed for health checks too. We recommend that the dog owner should bring in the dog groomer to do Shih Tzu grooming whatever the coat length will be, and that way the dog will learn to trust being touched and handled during grooming. The first few steps in teaching a puppy about Shih Tzu grooming does not even require any tools. The first step is to teach your puppy that being touched and stroked is very enjoyable. Handle your puppy. Put him on your lap and rub your hands over his feet and legs. Rub around his nose and eyes. Handle his ear. Gently open his mouth and rub you finger over his gums. Stroke his tail. Teach him to sit quietly on your lap for short periods of time. The big lesson here is for him to learn to trust you. Some dogs don’t like being touched around the face and on their feet. Some dogs don’t like having their mouths opened. That is why it’s important for them to learn that these things are not threatening or painful. Some puppies don’t like the idea at first but soon they find its nothing to be threatened by or scared of and enjoy being petted and love the extra attention. There is a way you can trim the hair over the bridge of the nose, so that the hair does not grow up, into, and onto the face, but it does require a steady hand and very regular trimming. So, our final Shih Tzu grooming tip is that once you have decided to clip this hair, you are pretty much making a commitment to keep this area trimmed all the time, because it does grow quite quickly and those little hairs can irritate a Shih Tzu’s sensitive eye area. Care and grooming of the clipped Shih Tzu does have some similarities to that of the Shih Tzu grooming for a full coat. Keeping the coat clipped short does reduce grooming frequency although there is still grooming required depending on the style that your Shih Tzu is groomed in. 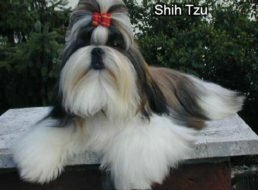 Thanks for the interesting read about some grooming tips for Shih Tzu. I actually had no idea that it’s important to make sure that the puppy learns and knows that being touched isn’t threatening or painful. You went over some ways to do this, and I’m curious to learn how long it can take for the dog to learn this, or if there are some other tricks to utilize if the dog is struggling to trust you. Thanks for the helpful Shih Tzu grooming tips! My wife and I recently got a Shih Tzu and were wondering how to keep her groomed. I had no idea that their hair could grow over their nose and face so quickly. We’ll be sure to keep it trimmed regularly so it doesn’t irritate her eyes. I also have Shih Tzu. Once I groomed him myself without having knowledge on grooming dogs, It was my good try but it looked so messy. Now i am about to cut his hair again and thought of learning to groom. Thanks for this post, that it is especially for grooming Shih Tzu and I got idea from this post. Thanks again.